There are countless possibilities for tours, at this point I would like to suggest a few. Basically, it is for example possible to do trips to the nearby waterfalls, to do crocodile tours, coffee tours, dolfintours, riding-, surfing-, canoeing- and rafting tours. The important thing is what you are interested in personally, according to your needs we can put together ideas. You can go on a day trip to the almost 1,900 m high volcano Rincon where you can enjoy mud baths and hot springs with about 45 degrees Celsius. The volcano is still active and is located in the surrounding of La Vieja National Park where bubbling mud holes can be see. The travel time from the hotel to the volcano is about 3 hours, to stay overnight is possible, as well. is about 23 square kilometers, hosts a tropical dry forest and is known for a large cave system. To the park, where you can hike well, it is a 1.5 hours journey. The Rio Tempisque is with 138 km the longest river in Costa Rica. It runs from the Cordillera Guanacaste to the Palo Verde National Park and enters into the Gulf of Nicoya. Moreover it is possible to take a day trip by boat and watch crocodiles, birds and other exotic animals accompanied by a local guide. The trip to the river takes about 1.5 hours. You can do a trip to an organic coffee plantation in Santa Elena which lies almost 1000 meters above sea level. A magnificent view over the valleys of Nicoya in typical landscape is guaranteed. Here hardly any tourists come to visit, you will only meet villagers. The local waterfalls are not far away in Belen. Those are cascades that are nice for swimming. Afterwards, visiting a typical Costa Rican restaurant with a beautiful view on another waterfall is possible. Until a few months ago, the Arenal was one of the most active volcanoes in the world, the last major eruption was in 1968. Recently, however, he had reduced his activities severely. He is the youngest volcano in Costa Rica and has a height of about 1,500 m.
Meanwhile, the area has become very touristy and because of the discontinued activities of the volcano we only do trips to the Arenal by special request. Travel time from the hotel is about 4 hours, it is possible to a stop in the small town of La Fortuna, at the foot of Arenal to enjoy the hot springs and a waterfall. Another possible destination is the town of Tamarindo and the Tamarindo bay which is well suited for surfing. 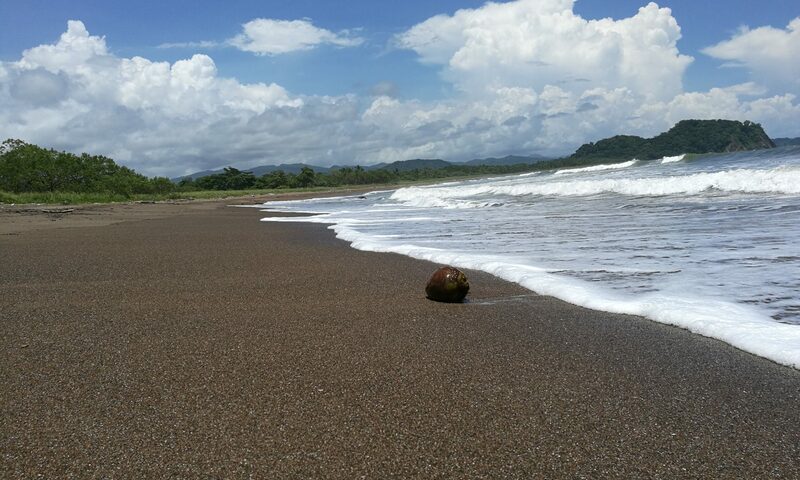 The fishing village of San Juanilo, the palm beach of Carrillo and the Poas Volcano also invite for a visit. Fantastic beaches in the area are Barrigona, Barco cebrado, Garza, Giones, Carrillo, Islita and Bejuco. Prices can be provided upon request and are calculated according to your selected tour.